Roasting a chicken is one of the easiest ways to prepare a delicious family dinner. Here are 10 different takes on the classic roasted chicken, including some tasty variations from around the world. And if you've never roasted a chicken before, or if you could use a little refresher on how to do it, here's a basic tutorial that will walk you through the whole process: How to Roast a Chicken. This garlic roasted chicken delivers a wonderful, mellow garlic flavor that isn't too overpowering. The garlic is roasted first, which brings out some sweetness. A classic. Greek oregano along with garlic and lemon juice give this classic Greek roasted chicken its Mediterranean flavor. 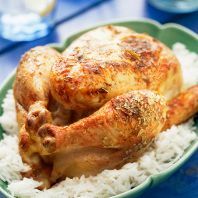 Moist and fragrant, this Thai-style roast chicken recipe is imbued with the flavors of lemon, lime, and lemongrass. Maybe it's the Yorkshire puddings that give this simple lemon and garlic roasted chicken its unique British flair. This Indian-style roasted chicken is flavored with turmeric, chili powder, and garam masala, and the bird is marinated in yogurt, garlic, and ginger paste. Instead of butter, this low-fat roasted chicken is brushed with olive oil and lemon juice before roasting. Removing the skin before serving helps keep the fat content down.